Selenium (Se) is an essential trace element for humans, yet about one billion people worldwide suffer from Se deficiency. Rice is a major dietary source of Se, increasing Se concentrations in grains has been attracting great attention from scientists as well as the public media to alleviate Se deficiency for over 20 years. In rice, most of Se retains in roots after it uptake from soil, thereby low efficiency of Se transport becomes a bottleneck for increasing Se contents in grains. The Researchers from Dr. CHU Chengcai group in Institute of Genetics and Developmental Biology (IGDB), Chinese Academy of Sciences, and Dr. ZHANG Lianhe group from Henan University of Science and Technology (HUST) tried to break the bottleneck for increasing Se contents in grains by increasing Se transport from roots to shoots. 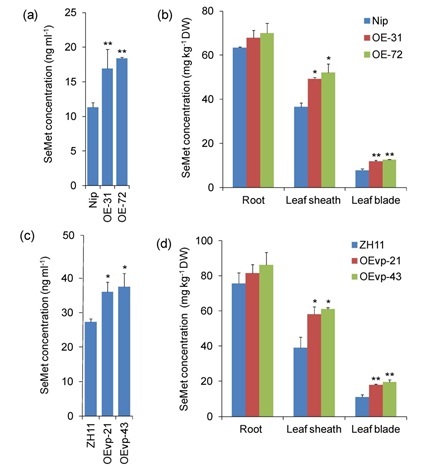 “We found that most of the selenite in rice roots transforms to selenomethinone (SeMet) after its uptake”, said by Dr. ZHANG Lianhe, the first author of this article, “therefore, improving selenomethinone (SeMet) transport from roots to aboveground parts could increase Se concentrations in grains”. Interestingly, they found that NRT1.1B, the important nitrate transporter gene also cloned by some group a few years ago, could increase SeMet transport from roots to shoots in rice, and increasing NRT1.1B expression could significantly improve Se contents not only in shoots but also in grains. “This study deepens our understanding of Se transport from roots to shoots, and provides novel insights into breeding of Se-enriched rice varieties by facilitating SeMet translocation”, emphasized by Dr. ZHANG. The article entitled “NRT1.1B improves selenium concentrations in rice grains by facilitating selenomethinone translocation” has been online published in Plant Biotechnology Journal (DOI:10.1111/pbi.13037).